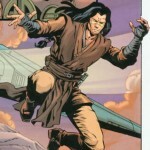 Quinlan Vos was a male Kiffar Jedi Master in the Jedi Order and a General in the Grand Army of the Republic during the Clone Wars against the Confederacy of Independent Systems. He hailed from the planet Kiffu in the Inner Rim. With long, dreadlocked hair and a band of pale yellow across his upper face, Vos was gifted with psychometric powers which allowed him to “read memories” from inanimate objects through physical contact. 2. Grey colored inner tunic (full or mock) Just visible under outer tunic. 3. Chocolate Brown tabards (must extend below obi in front – approx 1/2 way between obi & bottom of outer tunic / can end at obi in rear). 5. Belt with a wide leather main belt with a covertec (or similar), thinner secondary belt on top of the main belt, and a buckle. Thinner secondary belt cannot be loose or “sag”. 6. Lightsaber (No toy sabers). If bladed, blade must be green. 7. Brown Boots (leather or leather-look) must rise at least to the calf, but not above the knee. No visible laces. 10. Large Chocolate Brown outer robe. 11. Black shoulder length Dreadlocks with a tan colored hair wrap. Can be clean shaven or have stubble. 12. Grey gauntlet wraps from hand to just below elbow. 13. Yellow face paint above left eye and across the bridge of the nose. 1. Belt pouches 2. Food pellets (at least one set of 4) 3. Accurate lightsaber hilt. Nocturne Armory and Parks make custom sabers to suit. 4. Leather Strap and silver ring on both boots.